Use your empty Clorox or Lysol or Green Works wipes containers to keep plastic grocery bags! 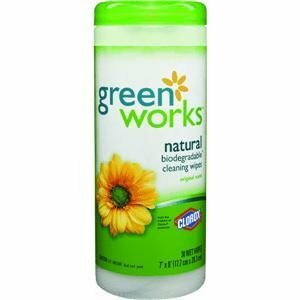 Keep one in your car for wet swimsuits, dirty diapers, trash, etc. Whatever you reuse plastic bags for, having a compact container full of them looks a lot better than a bunch of bags stuffed in a drawer. Plus they are so much more portable this way. In the original post, she even shows you how to fold put the bags in so they pop out one after another! Diane Walsh Marletto posted: I wonder if that would work for baby wipes too? Sarita Dorn Pearce posted: I like how pretty they made it. I wouldn't mind having this sitting on a shelf. Stacy Jay posted: I have a big cloth bag that hangs that I keep my bags in, but this is great for those areas of the house where I want to keep a few bags but look messy no matter where I put them. Now I won't have that problem. Jeanie Linder Deveau posted: Wow, I didn't think of that. 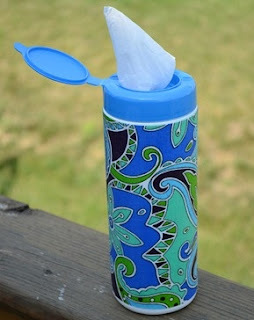 I have lots of empty dog wipe containers just like this. Hmmm... I know what I'm doing tomorrow! Gina Simmons posted: Use a little Mod Podge to cover the surface - shiny or matte, matte is probably better. Tear up colored pieces of tissue paper (the kind you use to wrap gifts) and arrange over the Mod Podge. Then cover with another layer of mod podge and let dry. 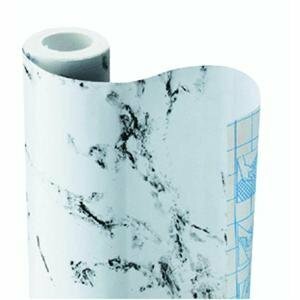 Another way to decorate is to find a pattern of contact paper you like that is adhesive backed, trim to fit around the canister, peel and stick. The smaller, box type or baby wipe containers I use to store dry sponges and cleaning cloths.